Charles Le Brun, Le Brun (Lebrun, LeBrun) (24.2.1619, Paris 12.2.1690, ibid), French painter, decorator and draftsman. He studied under F. Perrier (1632) and S. Vouet (1634-1637). Along with N. Poussin visited Italy (1642-1646), where he studied the works of Raphael, Bologna academics, antique sculpture. One of the founders of (1648), and 1668, the rector of the Royal Academy of painting and sculpture in Paris. Becoming in 1660-ies of the "first painter of the king" and Director of the Royal manufactory of tapestry, directed the creation of decorative ensembles in the interiors of the Louvre, Versailles, etc., performed ceiling (Mirror gallery in Versailles, 1678-1684; etc. ), cardboards for tapestries, designs for garden sculpture and furniture. In the painting of Lebrun ("the penitent Magdalene", 1656-1657; series of paintings "the Story of Alexander the great", 1660-1668; all in the Louvre, Paris) the normativity of classical compositions, imbued with theatrical pathos, combined with the decorative pomp of the Baroque. Charles Lebrun (FR. 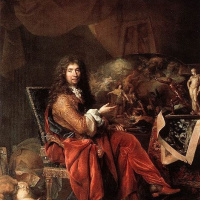 Charles Le Brun, 24 February 1619, Paris — February 22, 1690, Paris) French painter and art theorist, head of the French art schools of the era of Louis XIV. Born in Paris, eleven years, under the patronage of the future Chancellor of France Pierre Segur apprenticed to Simon Vouet. At the age of fifteen years carried out the orders of cardinal Richelieu, was spotted by an acknowledged master Nicolas Poussin, and in 1642 went along with Poussin in Rome. Scholarship Segur Lebrun worked in Rome, under Poussin, for four years. Back in Paris, Lebrun gained a new influential patrons, including the superintendent of finances Nicolas Fouquet, the order of which was painted portrait of Anne of Austria, and then entered the service of cardinal Mazarin. Working in the castle Vaux-Le-Vicomte, Le Brun was in the center of the intrigues of Mazarin, manipulated by rivalry between Fouquet and Colbert. Showing himself in this "case" with the best hand, he gained the respect of the winner — the Colbert. After coming to power, Colbert, inter alia, has led numerous art institutions and factories of France, relied on the cultural influence of the Sun King. Lebrun, his protégé, in 1648, was organized by the newly established Royal Academy of painting and sculpture, in 1660 — the Manufactory of Gobelins, in 1666 — which is still active nowadays French Academy in Rome. Personally directing and the Academy, and industrial plants, Lebrun directly influenced the tastes and Outlook of a whole generation of artists, becoming an important figure of the "Louis XIV style". The king himself shared and encouraged the art of Le Brun, especially after the triumphal celebrations of 1660 and the completion of the interiors of Vaux-Le-Vicomte in 1661. In the same year, he commissioned Le Brun, a series of paintings from the history of Alexander the great; the first of them brought the artist to the nobility and the title "First Royal painter" (Premier Peintre du Roi) and lifetime pension. From 1662 Le Brun controlled artistic all orders of the court. He personally painted the halls Apollonova gallery at the Louvre, and the interiors of the castle of Saint-Germain and Versailles (War Room and the World). With the fall of the Colbert Marquis de Louvois, and against the will of the king, tried to remove the Lebrun from working in the yard. Academy, faithful Lebrun, had re-elected him for another term, but court intrigues undermined the health of the aging artist, and he died before he could complete the painting of Versailles, which he completed based on his sketches Noel Coypel.